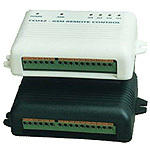 GSM alarm system TVGA402 is a versatile system of remote control. TVGA402 can commutate an electric circuit as by the order of SM, so in total current events automatically, with a help of built-in relay. Compatibility with mobile phones Siemens: C35, M35, S35, ME35, M50, MT50. Safeguards of flats, offices, garages, cottage, warehouses and cars. 2 relay of external equipment. 3 numbers for calling and for SMS. Controlling by using SMS in dialog mode with confirmation. Signal sound message in dial mode. Listening the object near mobile phone connected with TVGA402. Wide facilities in programming the parameters of inputs. Wide facilities in programming the parameters of relay. Versatile tuning of limitation of access from several phone numbers. Announce in the case of interrupt external power and discharging of accumulator of mobile phone. Built - in charger of battery of mobile phone. Presence of a TEST of mode. Operation temperature range: -20 to +60 oC. Simplicity in installation and connection of controller. Versatile tuning of limited access from a several phone numbers. TVGA402 have a list of three phone numbers, that let making access to the system only for the registered users, whose numbers are available in the list. You can, also, make a quantity of signal calls and SM. If necessary, you can allow the control from any other phones. delay of arm after coming active level. These parameters let us to tune the TVGA402 more easily for joining usage with maintaining alarm systems. Controlling by using SMS in dialog mode with confirmation. TVGA402 has a number of commands to controls. Name-pseudonyms are giving to Inputs and relay. The user can form readable controlling message, using the number of commands and names. Every command message begging with password. According of configuration TVGA402 can formed acknowledge message, that is why, user are always know a real condition of the system. Announce by using SMS. TVGA402 can form a signal message if it has discovered active level on inputs or system fault events (external power fault etc). Signal sound message in dial mode. TVGA402 can call to mentioned numbers from the list and produce a sound signals, according on current event, if it reveals an active level on inputs or system fault events (external power fault etc) has happened. Listening the object near mobile phone connected with TVGA402 can switch on by making a command on SM. TVGA402 will call to mentioned number. Wide possibility routing of events. The shift of inputs to active or passive condition could have an influence on a relay condition. You can program an influence of any input of any relay. Switch on ARM or DISARM mode could have an influence on a relay condition. It let use the relay in different configuration. For example, for switch on the hooter or automatic switch off fire emergency sensor when it active. Possibility of giving Name-pseudonyms for input. Every input and relay has it name which use in testing conditions and control. Every input has its name of active and passive condition. For example, if sensor active in case moving in room1, the user can get SM: ROOM1 MOVE. Name - Pseudonym can programming by user. to permit/prohibit of control of SM and from another sources. Announce in the case of interrupt external power and discharging of battery of mobile phone. TVGA402 can form SM and dial to pointing abonents in case of the fall or recovering of outward feeding and also in case of discharging of battery of mobile phone. Economic mode. You can tune the TVGA402 so, will be formed only in the case of very important emergency events, redundant calls are not possible. User / Installation manual (supplied on CD).